How do I recover the taproots of a tree? on 30 November -0001 . 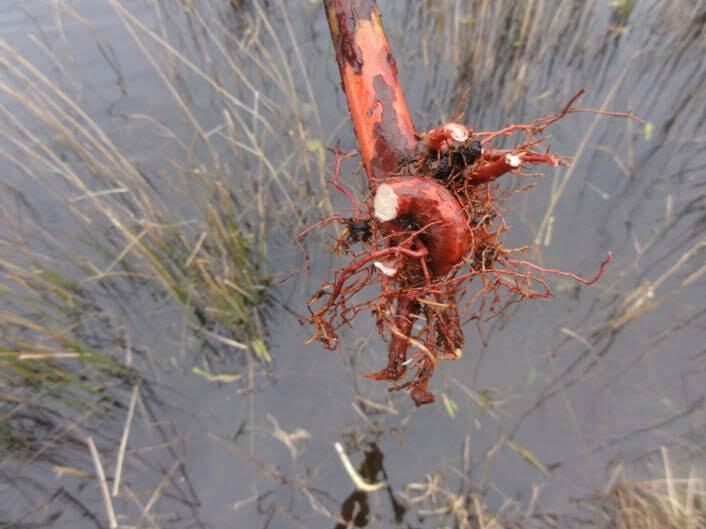 Nearly every tree or bush that is produced in a nursery using modern production methods leaves the nursery with destroyed primary roots (taproots). 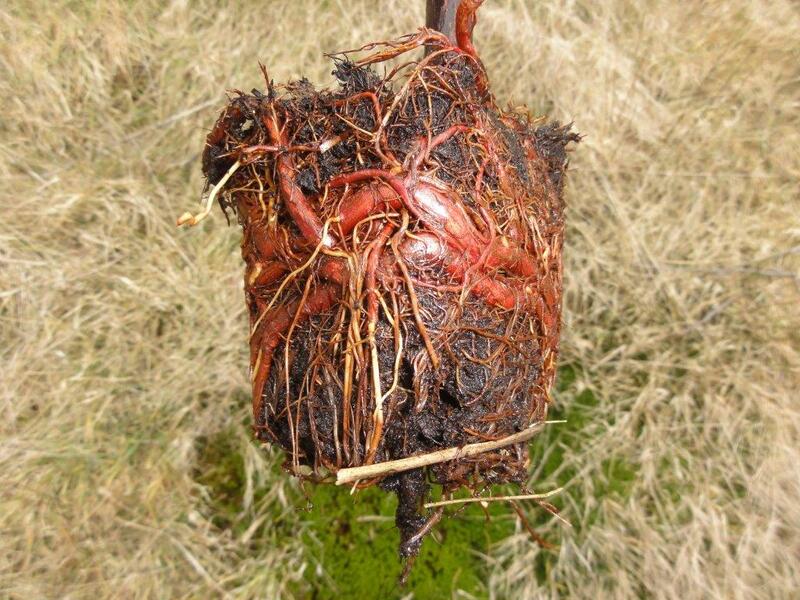 This is caused by the fact that the taproot has not enough space in a pot or plastic bag to grow vertically downwards. When the taproot grows downwards and reaches the bottom of a pot or a plastic bag, he starts to grow in horizontal circles or even back to the top. 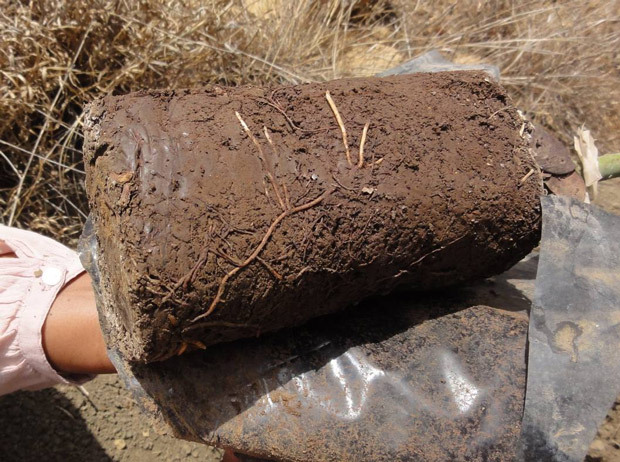 Once you plant such a plant in dry areas, the primary root is not capable of penetrating deeply into the soil to find water. 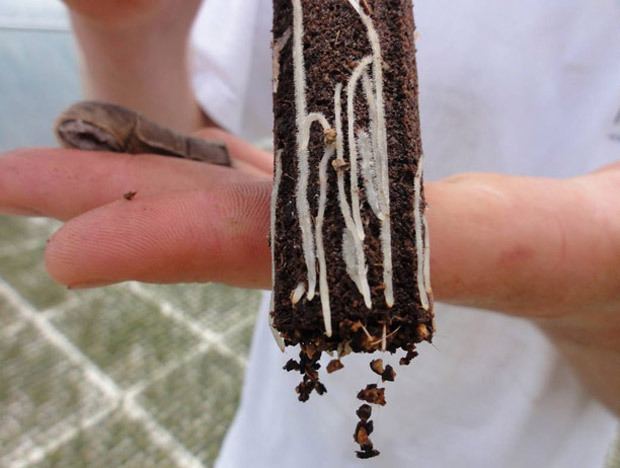 On this page, you will find all the information about how you can recover the taproots, making it possible for your plants to grow in dry areas with the help of the Groasis Waterboxx® plant cocoon and without any need for irrigation. 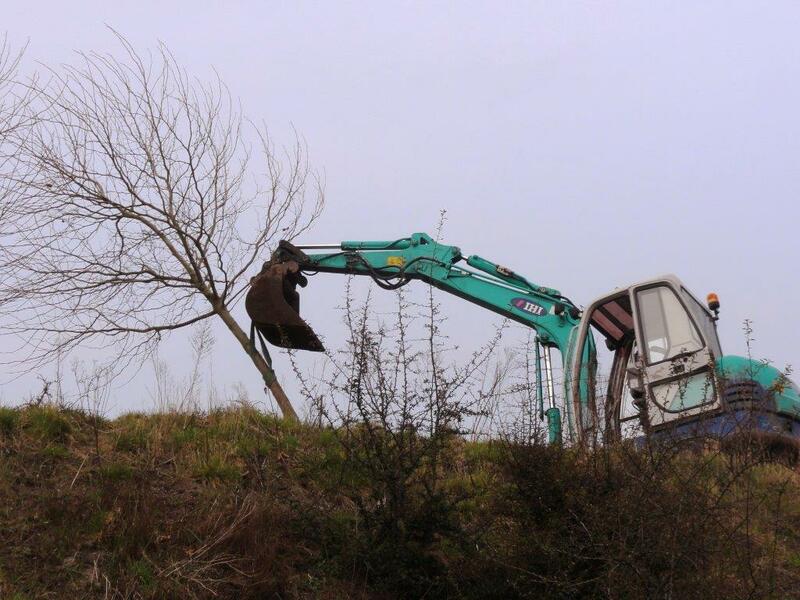 The photos above show you what the consequences are when trees are grown in pots/plastic bags and when they start to grow in horizontal circles. 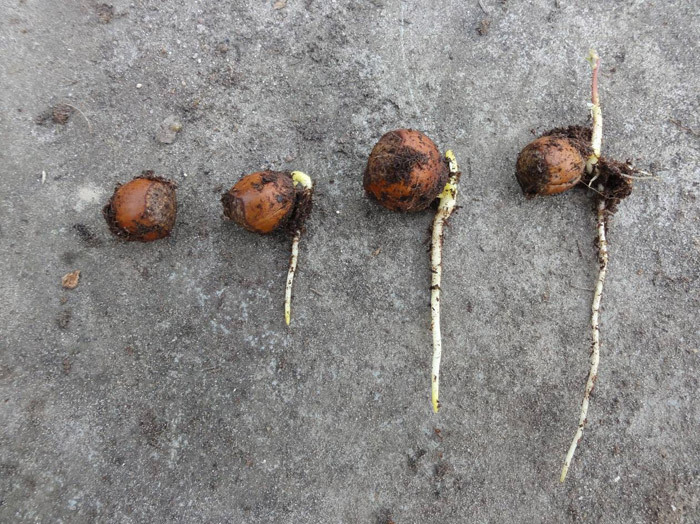 The photos show that when a taproot start to grow in a horizontal circle, he will never grow vertically downwards. Not even after years. This means that a taproot that is growing horizontally, will never grow automatically vertical. The consequence of this is that a taproot isn’t able to grow vertically downwards to search for water deep in the ground. 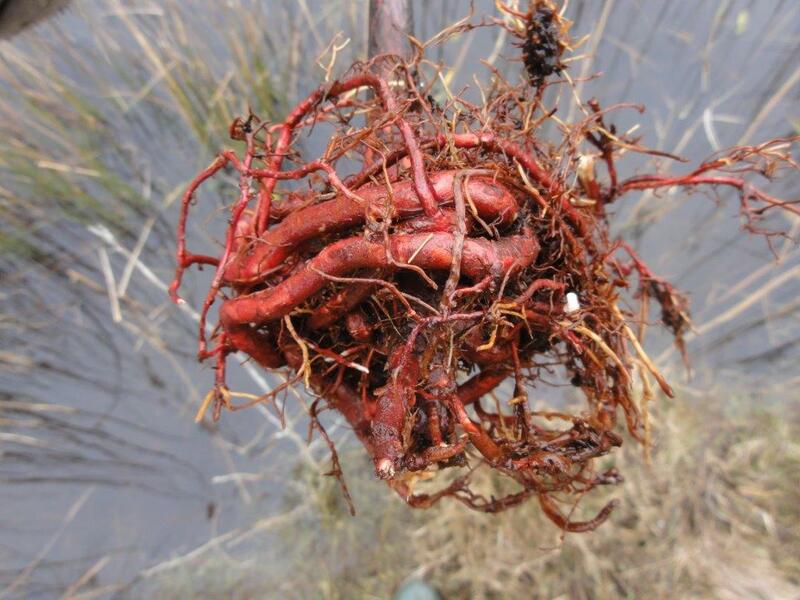 A tree with a destroyed circular growing primary root isn’t able to grow in areas without the use of irrigation. It is easy to repair a taproot. Cut the horizontal part off. The principal way of Mother Nature to reproduce and multiply is by sowing seeds on top of the soil. The seeds are usually transported and deposited on top of the soil by means of the wind or through the excrement of animals. The seed then starts to develop its primary root in order to find water, thereby establishing itself. 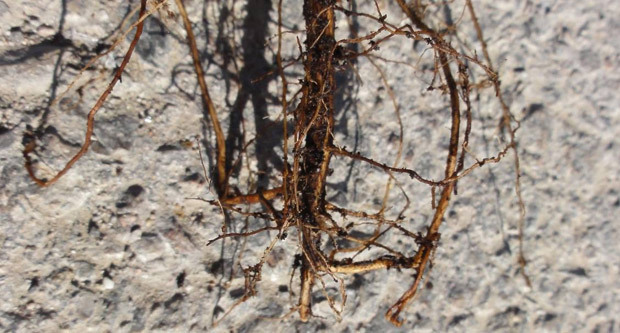 Once the primary root has found water, the plant starts to develop secondary roots, and then starts to grow and evaporate. Mother Nature's planting technique in 4 stages on one photo. As you can see, the taproot is growing vertically downwards. How can I take care of good taproots? 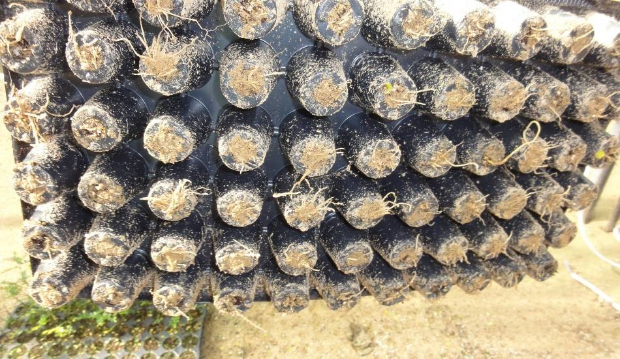 Plants sold today, multiplied with modern production methods, are produced with deficient primary roots. 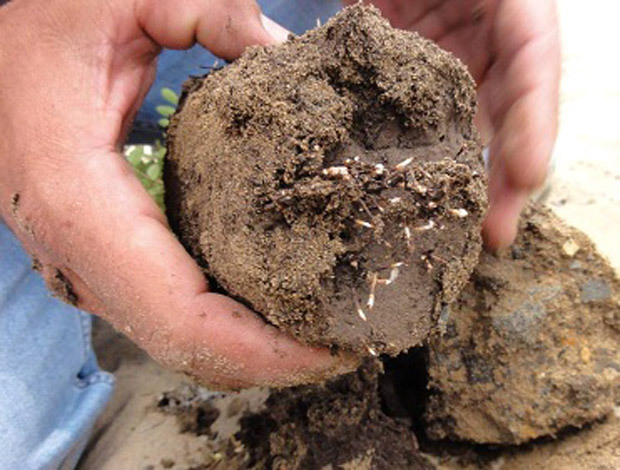 The plants are grown in such a way that the primary root is touching the bottom of the pot or plastic bag in which it is produced, and then starts to grow in horizontal circles, grows up again or splits into secondary roots. In recent years, Groasis bought and photographed plants in over 20 countries, and wasn't able to find a single plant among them with a perfectly downwards growing primary root. 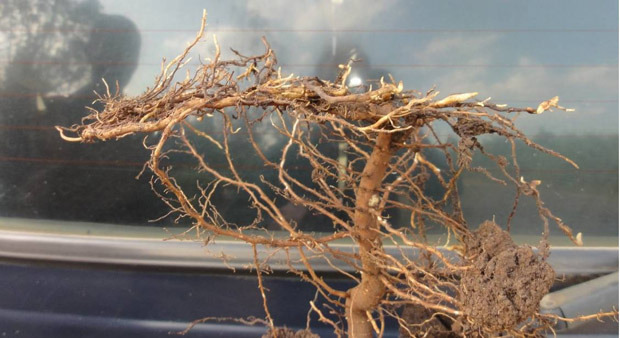 All purchased plants turned out to have destroyed primary roots and over-developed secondary roots. 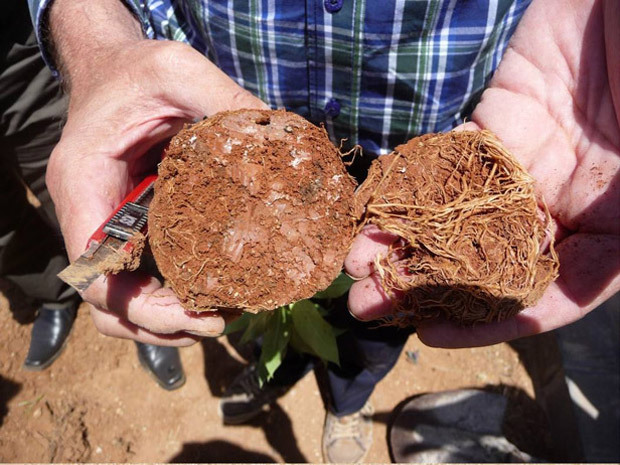 Plants with such roots are utterly unable to survive dry periods or dry soil without the help of irrigation. 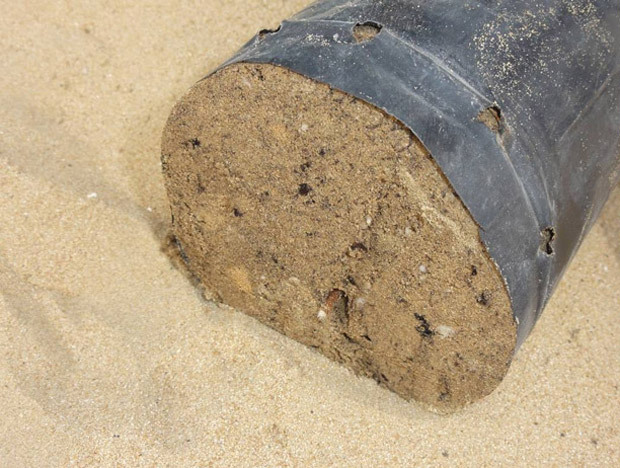 Moreover, secondary roots are not able to penetrate deeply into the soil or break rocks. 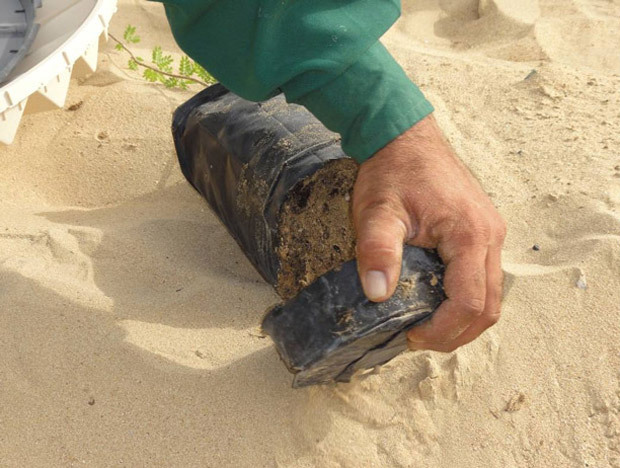 A young plant in Dubai (before transplanting into its second pot) has a destroyed, twisted primary root. developed, but they lack the power of the original primary root. downwards is already destroyed, and is growing horizontally instead. 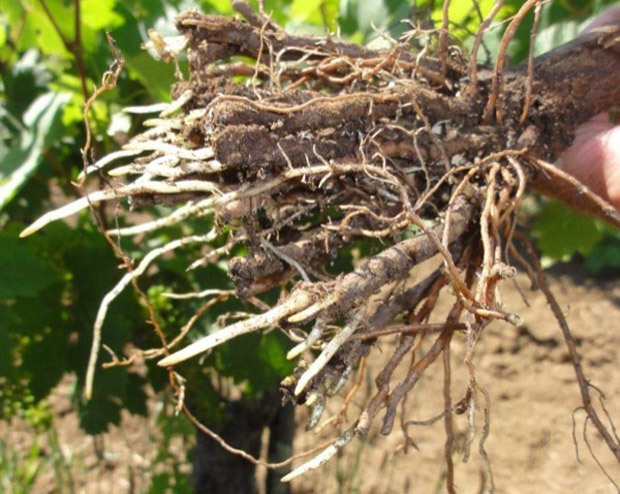 In recent years Groasis not only learned to produce plants with perfect roots. 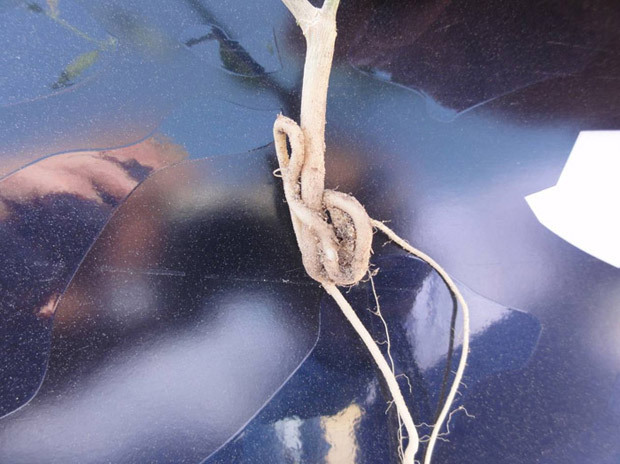 We have also learned how to repair plants with destroyed primary roots. The secret to recovery is to prune the horizontally or upwards growing parts of the primary root. 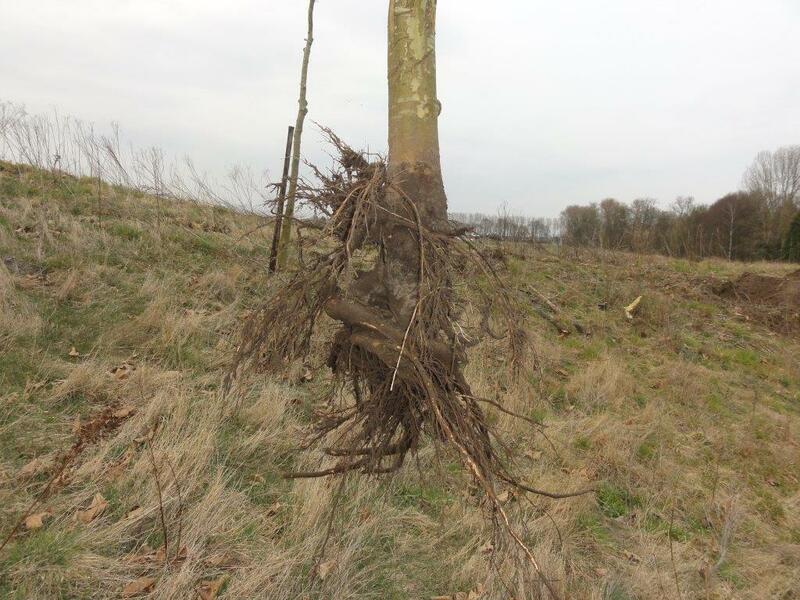 After pruning, the primary root resprouts and this newly sprouted primary root is growing vertically downwards again. 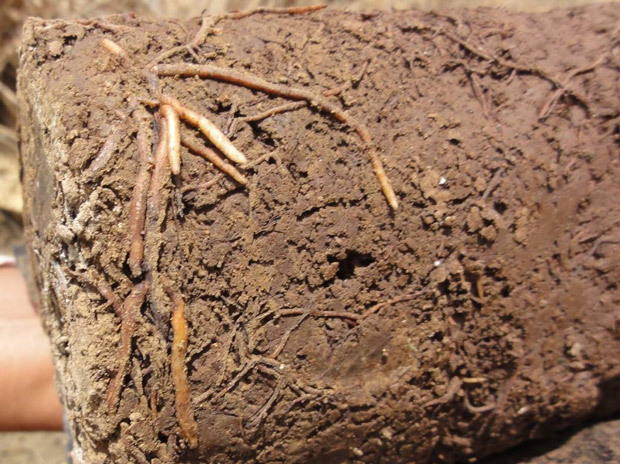 The root is now capable of penetrating dry soil or rocks. Which quality requirements are there? The plants must be in the nursery for at least two months hardened in full sunlight.